Image | This entry was posted in Bayesian Reasoning, Maps. Bookmark the permalink. There’s reason we call them the Great Lakes. Actually, the body of water that is circumscribing Florida is Hudson Bay, not Lake Huron. 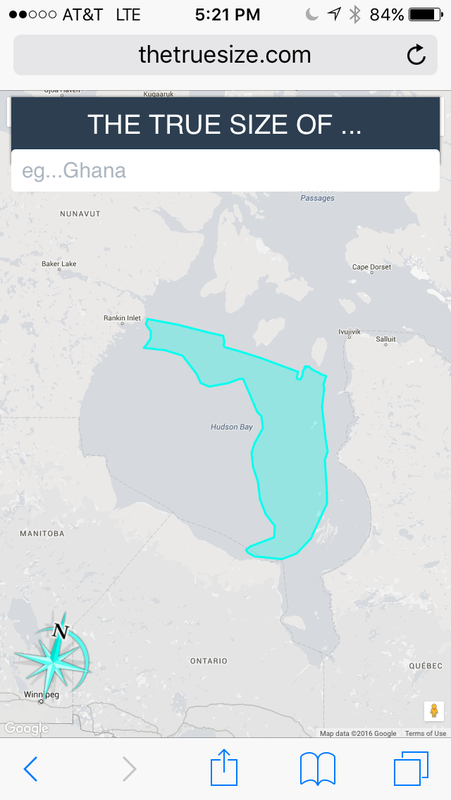 Hudson Bay could contain 20 Lake Hurons. Now that you have fixed the title of the post, my previous comment looks ridiculous. You could delete that comment, but then the comment you are reading right now would also look ridiculous. You could delete all the previously posted comments, including this one, and then I could post a comment like “Everything looks good now!”, but readers would wonder what *that* comment was about! There may be an isomorphism between “corrected” published accounts and expunged criminal records. *Someone* always remembers, and that *someone* will dispute the official record. When is a record not a record? Yes, this state of affairs not only poses a practical dilemma (the comments are out of place now), but also a philosophical one (the permanence of change: even if I hadn’t fixed the title, I would have seen that post differently, since I was now made aware of my mistake).